1. The Ozora Campus 9:30 and 11:00 services had the exact same number of people (+/- 1) last Sunday. So, we now have empty seats at optimal times to reach more people for Jesus. If you really want to help us MAKE ROOM for new people, let me encourage you to attend the 12:15 service. Our number dropped with the change to 12:15, so you will probably hear/see me pumping that service up on social media. The Walton campus is off to a great 2014, and we’ve seen a steady growth in attendance over the last few months. If you like to keep up with the weekly vitals, you can do it here. 2. We had $166,000 given to the 2013 Graystone Christmas Offering. PRAISE GOD! Our goal was $250,000, so this is the first time in Graystone history that we did not reach our goal. It is the second largest single offering at Graystone, and God always provides for our needs. From the offering, we’ve set aside money for our future Walton Campus permanent facility and now have a Walton Campus Building Fund. We will give a HUGE chunk to local and global missions during the month of January. And the rest will go toward the expansion of our Ozora Campus which will be a 2nd entrance and more paved parking. This will help tremendously with traffic flow and getting folks on and off our campus. We especially want first time visitors to have a good experience, and it starts in the parking lot. The Christmas offering will not be enough to cover all the cost of this expansion, but it will certainly help. THANK YOU to everyone who gave to the Christmas offering. All of these resources will be used to grow Graystone Church and the kingdom of God in our community and around the world. 3. 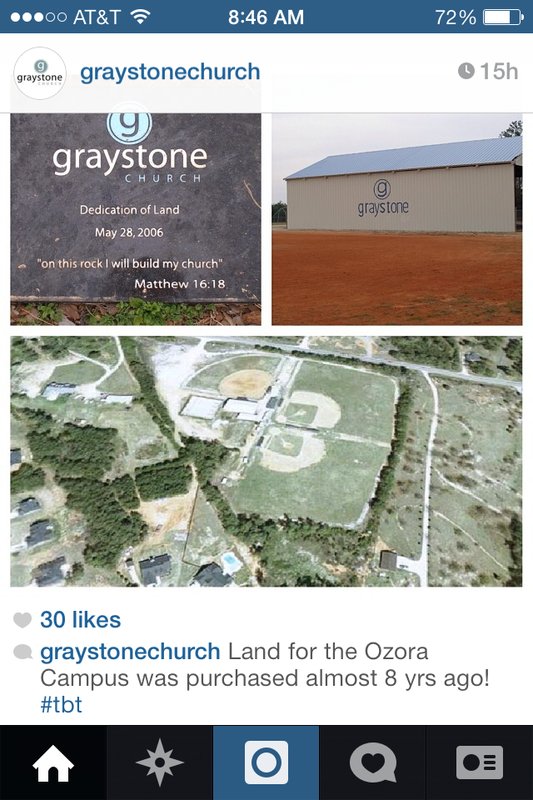 The Graystone Walton Sunday worship experiences are now one week behind our Ozora Campus. So this Sunday, Graystone Walton will be kicking off week 1 of our Life Hacks message series and will watch on video my message from last Sunday at Ozora. There are many reasons we decided to move to a one week delay, but the most important is for our Walton Campus to be able to expand to 2 worship experiences. We were unable to do that under our previous model of recording the first service at Ozora and driving it over to Walton. This also takes a huge stress off the production teams on Sunday mornings at both campuses. At some point in the future, we hope to move to a live stream, but right now, it is simply not cost beneficial. For the most part, there will be no real difference at Walton by making this change. Sorry if this is more info than you cared to know. If you are still reading this, then THANK YOU for your incredible interest in and commitment to Graystone. 4. Graystone Vision Night 2014 will be on Wednesday, January 29, at 7:00PM at our Ozora Campus. This is a special night each year as our Graystone family comes together to celebrate what God has done and look to the future. I will be sharing our major initiates for 2014 and the location and time-line for the launch of our next expansion campus. And I’m sure the music will be over the top with Kyle, Zach and the band. It’s always exciting when both campuses come together to worship God. 5. On a Howes family note: Julia, our middle child who rarely gets mentioned in my messages, transferred mid-year from Loganville Christian Academy to Grayson High School. Thanks to the help of Cassy Moon and others, Julia has a great schedule of classes with great teachers. She is having a smooth first week of school and is reconnecting with friends from elementary school. She now rides to and from school each day with her big brother. We’re excited to see what God is going to do at GHS over the next few years. Jessie has started her 2nd semester of kindergarten at Grayson Elementary, so we have a lot going on on the parenting side of things. This last point sounds a lot like a family Christmas newsletter. Anyway, if you would continue to pray for our PK’s (Preacher’s Kids), Jennifer and I would greatly appreciate it. Lagnaippe: Below is picture posted on “Throw Back Thursday” by Graystone on Instagram. This brings back so many memories and reminds me of how far we’ve come and ALL God has done. I am daily blown away by His grace and favor on Graystone Church. And I truly believe… The Best is Yet to Come!